Sculptor Zurab Tsereteli has proposed to erect a towering statue of Jesus Christ in Vladivostok to rival that of Christ the Redeemer in Rio de Janeiro, PrimAfisha reported today. The proposed statue is intended for the Zmeinka district of Vladivostok, where it will overlook the Eastern Bosphorus and Russky Bridge. 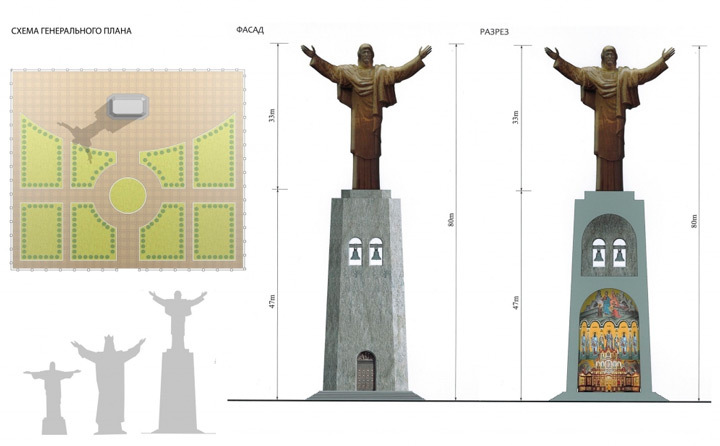 At 80 metres in height, the statue, if approved, will be 47 metres higher than the famous Brazilian landmark, and two metres taller than the Christ the King statue in Lisbon. The main project for the site, however, is a church, which will be built in the near future. According to Komsomolskaya Pravda, it may be that the Christ statue will be incorporated into the design of the church and stand on top of the future building. Georgian-Russian sculptor Tsereteli rose to prominence in the 90s and Noughties, completing many commissions for his friend Yuri Luzhkov, the mayor of Moscow at the time. Among some of his famous and criticised works is the statue of Peter the Great in Moscow, which has been voted one of the ugliest landmarks in the world.